From Eastern European dumplings to Egyptian street food, Matt Breen takes a culinary trip around the best international restaurants in London. Not to be confused with the spicy North African paste, this is a satisfying, slow-cooked chicken and wheat stew. Find it at Erebuni. Barbican. A rich, obscenely moreish combo of mussels and a creamy white wine sauce. Find it at The Dovetail. Farringdon. Deep-fried croquettes of bulgur wheat, packed with cinnamon and parsley-flecked mince-meat. Find it at Yasar Halim delicatessen. Harringay Green Lanes rail. A Central European staple that isn’t complete without a side of sauerkraut and dumplings. Find it at Czechoslovak Restaurant. West Hampstead. An open sandwich coupling various meat or fish toppings with dark, pungent rye bread. Find it at Snaps & Rye. Ladbroke Grove. Eat it in front of a roaring fire on a cold winter’s evening, preferably after a full roast. Find it at St John Bread & Wine. Shoreditch High St Overground. A punchy Baltic salad of pickled herrings, spuds, peas and sour cream. Find it at Baltic Restaurant & Bar. Southwark. A pizza-like tart topped with anchovies, caramelised onions and garlic. Find it at Baranis. Chancery Lane. Cute and tasty dumplings filled with mincemeat, parsley and coriander. Find it at The Georgian. Clapham South. These sausages are the traditional Bavarian between-breakfast-and-lunch snack. Find it at Stein’s. Richmond. A dish of stewed tomatoes, onions and peppers, flavoured with – you guessed it – truckloads of paprika. Find it at The Rosemary. New Cross Gate Overground. After a few Icelandic farmers filled some barrels of meat with milk to help preserve it, they later discovered a fermented goo growing on its sides. Gross, yes – but that’s how this yoghurt was created. Find it at Texture. Marble Arch. A dish of mash potatoes, leeks, kale, and plenty of butter. The Irish like to make this at Halloween, and hide a ring somewhere in its spuddy depths: whoever finds it will marry next. Find it at Mother Mash. Oxford Circus. If you ask me, the creator of ‘Popeye’ must have been a spanakopita fan. It’s not just a tasty treat that crams layers of melty feta and creamy spinach between sheets of flaky filo pastry. It’s also the post-booze breakfast of champions: so fortifying that, as that spinach hits your stomach, it wouldn’t be that surprising if your biceps and forearms started bulging. Alexi Duggins. Find it at Opso. Baker St.
A melting, slow-cooked shin of either beef or veal, served on top of a bed of risotto. Find it at Mimmo La Bufala. Belsize Park. And the Stodgiest Food Award goes to this little Baltic stunner: potato cakes stuffed with mincemeat. Find it at Smiltė Restoranas. Walthamstow. A bit like mini-pancakes, these sinful little treats come slathered in things like powdered sugar, compote or even advocaat. Find it at My Old Dutch. Various locations. Not unlike the Turkish dolma, this is a cabbage leaf rolled around mincemeat, onions and rice. Its hearty deliciousness belies such basic ingredients. Find it at Patio. Goldhawk Rd. A pork sandwich, loaded with heat and flavour and coming in a variety of tempting variations. Find it at Taberna do Mercado. Liverpool St.
Hey! Don’t pull that face! This is one of Romania’s most famous recipes and reportedly an excellent hangover cure. It mixes beef tripe, garlic, sour cream and vinegar to bracing effect.Find it at Cornelius Restaurant. Tottenham Hale. A hearty, bright red soup made from beetroot and topped with a large dollop of sour cream. A bona-fide classic and as Russian as Dostoyevskian despair. Find it at Mari Vanna. Knightsbridge. All sorts of bits of a sheep mixed with oats, onions and spices, then encased in its own stomach lining and boiled. Sounds appalling, tastes amazing. Find it at Boisdale. Various locations. These big white anchovies are the salty cornerstone of any tapas spread. Find it at Barrica. Goodge St.
Or, in English, ‘cinnamon rolls’: essentially the pastry equivalent of crystal meth. Find it at Fika. Locations in Brick Lane and Roman Rd. A grated potato fritter – originally eaten for breakfast now an après-ski treat – from the nation of watchmaking and iffy banking. Find it at St Moritz. Tottenham Court Rd. A fiendishly good pizza-esque concoction of dough, ground lamb mince and peppers, cooked in a wood-fired oven. Sometimes, there’s no substitute. Find it at Antepliler. Harringay Green Lanes rail. These small filled dumplings are one of 12 dishes traditionally eaten by Ukrainians on Christmas Eve. Lucky them. Find it at: Prosperity Café. Twickenham rail. This isn’t just cheese on toast, oh no: the indulgent topping also contains ale, mustard, eggs and close-harmony singing. Find it at J Sheekey. Covent Garden. You might feel a little disappointed when this steaming pile of rice, carrots and sultanas arrives. Who wants a sweet rice salad, right? But thrust your fork into the mound like an archaeologist on an exotic dig, and you will unearth a real treasure: a massive chunk of meltingly tender lamb. It’s like a meaty Kinder Egg, or a lightly spiced surprise biryani, and it’s brilliant. Eddy Frankel. Find it at Ariana II. Brondesbury rail. A sweet and exceedingly pretty cake delicately made with almonds, honey, lemon zest and vanilla. Find it at Khamsa. Brixton. A carbtastic street food triptych: rice, lentils and pasta in a spicy tomato sauce. Find it at Koshari Street. Leicester Square. Chunks of diced lamb served on injera ‘tablecloth’ bread. Tear, dunk and wrap: no utensils needed. Find it at Adulis. Locations in Oval and Clapham Junction. And a similar dish from this next-door neighbour – only here, the injera’s fried until crispy and served with an aubergine dip. Find it at Lalibela. Tufnell Park. Fist-sized balls of rice swimming in a peanut soup. Simple and delicious. Find it at Sweet Handz. Holloway Rd. A tomato-rich stew in which the fleshy, flavour-gobbling aubergine takes centre stage. Find it at Hana. West Hampstead. Like a shepherd’s pie, but with a topping of tahini and yoghurt rather than mash. Comfort food, Middle Eastern-style. Find it at Honey & Co. Warren St. Proof that salads are anything but flavourless – this one with lemon and sumac is so tangy it’ll make your eyes water. Find it at Yalla Yalla. Locations at Winsley St and Green’s Court. Moreish little steamed dumplings from this tiny Indian Ocean island, made with the radish-like chayote fruit. Find it at Marcel & Sons. Elephant & Castle. Named after the conical clay pots in which they’re cooked, this fragrant, fruit-sweetened meat stew is a gloriously unhurried affair. Find it at Momo. Piccadilly Circus. The West African incarnation of the kebab, marinated in a blend of spices and ground nuts. Find it at Enish. Ladywell rail. A kind of oversized couscous, typically served with chickpeas and squash. Find it at Maramia. Westbourne Park. Somewhere between falafel and bhajis, these tasty little snacks are made of black beans. Find it at The Village. Hammersmith. From Durban’s Indian community, bunny chow is curry in half a hollowed-out loaf of bread. Find it at Bunnychow. Leicester Square. Eggs baked in a spice-heavy sauce of tomatoes, onions and peppers. Mop up with flatbread. Find it at The Good Egg. Stoke Newington Overground. A porridge-like mix of maize flour and water, served with a plate of greens. Find it at Afab Star. Deptford Bridge DLR. Packed with meat and spices, these pasty-type snacks are popular across Latin America. Find it at Zoilo. Bond St.
Hurrah for the Canadians! Not only have they made politics more palatable with their cool-as new Prime Minister Justin Trudeau, they’ve also made the oh-so-sloppy but oh-so-satisfying combination of chips, cheese and gravy trendy to eat. This Québécois fast food (which features cheese curds rather than the grated stuff) has been embraced by Londoners in the last couple of years. And rightly so. Gail Tolley. Find it at The Poutinerie. Sundays at Brick Lane Market. Liverpool St. This hot stew of seafood is cooked in coconut milk and laced with lime, paprika and chillies. Brazil in dish form. Find it at Made in Brasil. Camden Town. The spicy jerk seasoning and lime in these steak sandwiches give them their vibrant Latin American character. Find it at El Vergel. Borough. A pan-Latin American soup that in its Colombian variation incorporates oxtail, cassava and plantain. Find it at Lenos y Carbon. Elephant & Castle. A dish of prawns cooked in a spicy sofrito sauce of tomatoes and peppers, this is every bit as raucous and fun as its native country. Find it at Cubana. Waterloo. A thick potato soup topped with avocado and cheese. Warming stuff. Popular in the Andes, as you might imagine. Find it at Tostado. m Tottenham Court Rd. Pronounced ‘po-kay’, this is a colourful raw fish salad started out as a no-frills lunch for Hawaiian fisherman. Now, though, it’s found pretty much everywhere across America’s sunniest state. Find it at Pond Dalston. Dalston Kingsland Overground. An odd little fruit that tastes a bit like eggs, the ackee was introduced to Jamaica from west Africa in the eighteenth century. Out of it came this classic national dish, usually served with dumplings and a fiery blast of sliced scotch bonnet. Find it at Ma Petite Jamaica. Camden Town. A crisp taco shell is piled high with fillings to make your tastebuds sing, often but not exclusively meat, guacamole, salsa and fresh herbs. A delicious, messy hand-snack. Find it at Breddos Tacos at Dinerama (Shoreditch High St Overground) and Hawker House (m Canada Water). A stew of meat or seafood from Louisiana, it’s packed with all the strong flavours of Cajun cuisine and is a kind of culinary embodiment of New Orleans. Find it at The Lockhart. Marble Arch. A refreshing dish of raw fish in lime juice which is said to hark back to the conquistadors, who brought the fruit over from Spain. Find it at Andina. Shoreditch High St Overground. A flatbread that came over with the Caribbean islands’ Indian settlers – no plate of curried goat is complete without it! Find it at Roti Joupa. Clapham North. A stew of shredded beef and black beans which is the de facto national dish of the country. Find it at Mi Cocina es Tuya. Crystal Palace Overground. A sweet-and-sour, Persian-influenced dish that combines chicken, almonds, rice and barberries. Find it at Azerbaijan. Ravenscourt Park. Like a lot of Bengali curries, this is a fish dish – a pomfret fried in a sauce of onions and tomatoes. Find it at Kolapata. Whitechapel. This delicious fish noodle soup shows influences of both India and Thailand. Win-win. Find it at Mandalay. Edgware Rd. Glazed in spices and cooked in a hoisin sauce, this one’s a favourite on restaurants and takeaway menus everywhere. Find it at Royal China Club. Baker St.
One of the county’s most famous culinary exports. A so-red-it’s-almost-glowing curry dish. Find it at Gymkhana. Green Park. A good dolsot bibimbap is a full sensory experience. First there’s the tantalising smell and sound of rice sizzling against the hot stone bowl. Then the ritual of combining the elements while it continues to cook: sliced veg, beef, a sunrise-like egg on top and gochujang chilli paste stirred in at the end. This really is the ultimate comfort food. Oh yeah, and it tastes great too. Sonya Barber. Find it at Po Cha. Waterloo. Diners fling chunks of meat and veg into a pot of simmering broth: as much a ritual as a dish. Find it at Little Lamb. Piccadilly Circus. This hearty mix of stewed lentils and rice is a staple of the Nepalese diet. Find it at Yak & Yeti. Various locations. Sizzling and covered in a Punjabi masala of spices. Find it at Tayyabs. Whitechapel. A coconut-milk batter pancake filled with scrumptious curried stuff. Find it at Jaffna House. Tooting Broadway. Pilaf, paella, pulao – in this Central Asian country, the rice-and-other-stuff dish is plov. Find it at Navruz. Cricklewood rail. Sponge squares smothered in chocolate sauce and rolled in coconut. And, if you’re lucky, containing a layer of cream or jam. Find it at Department of Coffee and Social Affairs. Various locations. A national delicacy and an international acquired taste: snails simmered in coconut milk. Find it at Romulo Café. Kensington Olympia. Cook red meat in coconut milk with ingredients like galangal and lemongrass, simmer until it’s a thick paste, and you get rendang. Find it at Nancy Lam's Enak Enak. Clapham Junction Overground. Nothing sums up Japan’s culinary minimalism better. Find it at Sushi Tetsu. Farringdon. A tasty unleavened flatbread that you’ll find in market stalls across southeast Asia. Find it at Roti King. Euston. NZ’s weird and wonderful spin on the burger has two unexpected ingredients: beetroot and a fried egg. Find it at Gourmet Burger Kitchen. Various locations. A mixed salad of fruit and vegetables popular throughout the Malay Peninsula. Find it at Singapore Garden. Swiss Cottage. A popular Taiwanese street food snack, that’s basically a Far Eastern black pudding. Savoury, salty and 100 percent satisfying. Find it at Bao. Oxford Circus. 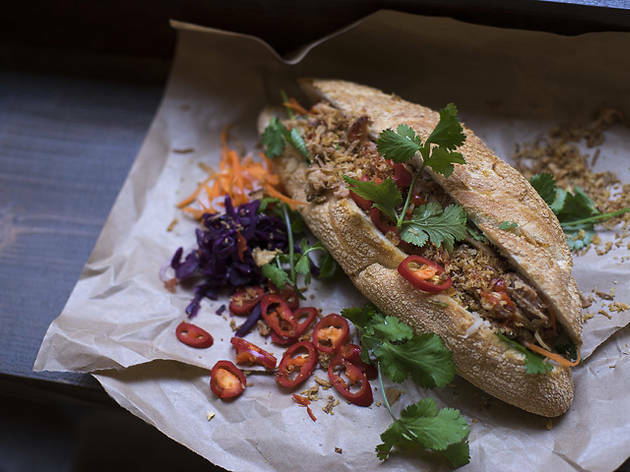 A baguette filled with pâté, pickles and fresh herbs which has added a spicy kick to Londoners’ lunchtimes. Find it at Whaam Banh Mi. Piccadilly Circus. Wander through any marketplace in this street-food nation, and you’re bound to find at least one vendor flinging prawns, vegetables, chillies, lemongrass, galangal, holy basil and kaffir lime leaves into an urn of broth that’s simmering on a hotplate. Hot, sour, fresh and fragrant all at once, to slurp a tom yum soup is basically to taste the Kingdom in a spoon. Matt Breen. Find it at The Heron. Edgware Rd. Looks suspiciously familiar... www.80platesaroundtheworld.wordpress.com At least credit the person you've copied! Zereshk polo from azerbaijan? Yea right! As mich as fish and chips from mongolia!